Many thanks to Brendan McGrath who wrote this brief history of the development of Life Saving in County Clare. Co. Clare was the first county to form a Life Saving and Swimming association in 1937, and to have life guards on all it's popular beaches. Harry Gillespie and John Quinn were the driving forces behind the formation of the Clare Swimming and Lifesaving Association. Harry was a member of the Garda Síochana while John was secretary of the County Clare Board of Health. Both were deeply concerned with the annual loss of life in local rivers, lakes and beaches. Gillespie was skilled in both swimming and lifesaving while Quinn had the local knowledge. With local contacts and government support, they formed the Association in 1937. It was made up of swimming and lifesaving clubs from Clarecastle, Ennis, Liscannor, Lahinch, Lisdoonvarna, Kilkee, Killaloe, Miltown Malbay and Spanish Point. The Clare association was affiliated to the Munster Branch and the county clubs were affiliated to the Assocaition. A county championship was held each year, with a special medal being designed incorporating a lifesaving motif for the winners. Unlike today, every gala had a lifesaving competition and each club member was taught lifesaving techniques. The success of the association and resultant decrease in drownings within the affiliated areas highlighted the lack of lifesaving awareness in other parts of the county. Harry Gillespie realised the limitations of the Clare Association to penetrate every part of the county. Around this time the American Red Cross Society taught water safety and resusitation. The Irish Red Cross taught the latter. In 1945, Harry, Eddie Heron and P.G. Condon formed the Irish Red Cross Water Safety section. The Clare Association adopted the methods advocated by this new organisation. Involvement with the Red Cross gave water safety a high profile. Water Safety weeks were held at venues nationwide to bring water safety to areas where lifesaving or swimming were never taught before. These weeks continue in areas that do not have the luxury of indoor swimming facilities. 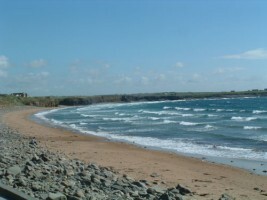 The White Strand, Miltown Malbay was one of the first outdoor venues in Ireland, with the first weeks being organised by Harry Gillespie. This venue continues to be used and is still very well attended. Competitions were a very important part of the calender for all life saving clubs. The county champions competed for the provincial title after which the four remaining teams competed to decide who would be national champions. In 1938, Miltown Malbay Swimming and Lifesaving club represented County Clare while contesting for the Irish title. Teams from the county continue to compete for nationals titles and have recorded many successes over the years. A relatively recent addition to the current water safety calender is the National Surf Lifesaving competition. These competitions bring life saving into the harsh outdoor environment of the seas around the Irish coast and serve to promote open water life saving skills and the use of modern day life saving equipment. The Surf Life saving competitions compliment the National Nipper, Junior, Senior and Masters indoor competitions. Since 2002 members of Clare Water Safety have represented their country at European and World Championships in Germany, Italy, the Netherlands and Australia. European and World titles as well as European and World Masters records have been achieved by an elite few from the county. Water safety in Clare is now administered by the Clare Water Safety Area Committee under the auspices of Irish Water Safety. Ireland is well represented at international level and has been a dominant force in the formation of the new world body for the promotion of Life saving internationally, i/e/ International Life Saving (ILS). Water safety continues to be taught by commited volunteers at beaches pools and lakes around the county and many of our most popular beaches are now supervised by highly trained lifeguards.